Give yourself time to wonder and please share! Please share what you wonder about. We discover more when we do it together. While millions of people play games on Facebook apps daily, such as Bubble Blitz, Farmville and more, a dedicated group of Facebook ‘s Rewarder.com app fans are seeking answers, sniffing out clues and doing the research to help others realize their dreams or perhaps just find that fave shoe that fits perfectly. If you’ve taken the plunge to set up your Rewarder account and wonder how to get started, here are five easy ways you can make the most of your efforts in just a short time. 1. Complete your profile and verification steps – Providing as much information about yourself as you feel is necessary at this point, as well as what you feel comfortable with, can boost your levels and points to help you unlock maximum Rewarder benefits. As you get to know the app and get a feel for how it works along with the Rewarder team responses, you can always add more to your profile and complete more verification steps. 3. Get Social – Since Rewarder is a Facebook app, you can easily invite all your FB friends to join you in playing detective, learning and helping others while earning cash via PayPal or gift certificates to use on Amazon. With just one click, you can send out an invite. In addition, you can invite former schoolmates as well. You’ll be able to “LIKE” and “PIN IT” along with showing your connections just how special a neat reward is and remind them that they, too, can do exactly what you’re doing. 4. Get Started – Select your first Reward and dive in, to give it a try. With the Easy to Win category, you can get off to a simple start. A bit of advice here: look for the Prepaid Reward sticker for the fastest, most reliable return on some cash. Rewards that say, “Reward Creator rarely responds” can be fun, but don’t set your hopes too high in the beginning, especially. 5. Rinse and repeat – Setting a daily goal of submissions is a healthy, active way to stay focused on using Rewarder effectively. Even making two submissions a day can result in seeing your money bank build consistently. 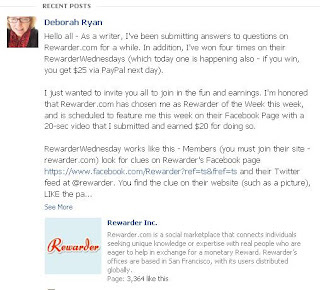 For an extra added boost, explore Rewarder Wednesday (win $25 next day via PayPal by finding the Mystery Reward) and keep abreast of any special contests or promotions, such as $20 for a 15-second testimonial video recording. 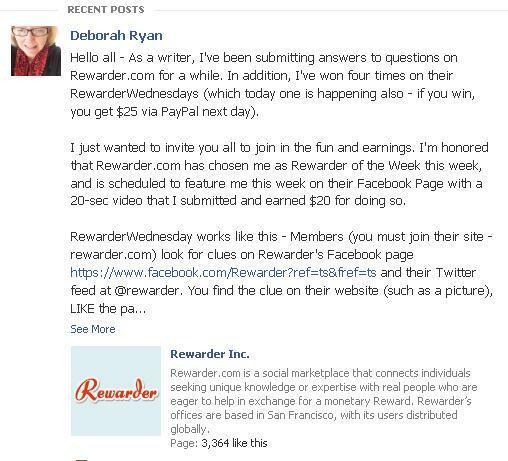 Personal note: Deb Ryan has been using Rewarder only a short time, yet she has won on Rewarder Wednesday four times (equals $100) already. She has also received a $20 reward for a 15-sec video testimonial. 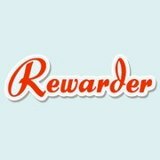 In addition, she regularly answers questions for the FAQ Corp., which is a prominent Reward Creator on Rewarder.com. I am a freelance writer who wonders about the same things other people do. I started this blog to write about my wonderings and others that are shared with me. I invite anyone to share their "I am wondering about..." and follow my blog, to see what other people are wondering about. Copyright 2011 - 2012 I Am Wondering. Ethereal theme. Powered by Blogger.